Does your institution create multilingual exhibits? Do you wonder about how multilingual exhibits may influence engagement and learning? • How bilingual exhibits can support engagement with science, technology, engineering, and mathematics (STEM) among Latinos in the US. The BERI team conducted interviews with professionals at 22 U.S. informal science education (ISE) institutions to document current bilingual exhibit practices. This effort builds on a survey conducted by ASTC and the Exploratorium in 2011. • Who is the audience for bilingual exhibits? • What is the form and content of bilingual exhibits? • What is the process for creating bilingual exhibits? Publication of these research results is in progress. Many institutions believe that providing Spanish text increases engagement among Spanish-speakers, although we have very little information about how visitors actually use bilingual exhibits and the resulting benefits. ISE professionals’ questions about audiences and bilingual exhibits have helped to shape the research agenda with visitors, e.g., Who uses bilingual exhibits, and how? Do bilingual exhibits create visual or mental overload? How much Spanish text is enough? Will bilingual exhibits encourage attendance? Observations and interviews with Spanish-speaking visitors in social groups will document how visitors use exhibit resources and how they perceive the benefits of bilingual exhibits. • How do individuals and groups engage with text in bilingual exhibits? • What indicators of learning can be observed? • How do patterns of engagement and learning correspond with exhibit features? • How do visitors perceive the benefits of bilingual exhibits? Post a comment! What are your questions, concerns, and conundrums related to bilingual exhibits? What have you learned about creating bilingual exhibits? Are you engaged in cross cultural visitor studies in museums? San Diego Natural History Museum, the Miami Science Museum, and two other ISE institutions chosen to represent diversity of content, geographic region, and Latino cultural groups. We began data collection in June 2012 and will complete in fall 2012. This Pathways research project will be completed in June 2013. This exploratory research, funded by NSF’s Division of Research on Learning, will build knowledge about how informal science institutions create bilingual exhibits, how visitors use bilingual exhibits, and how bilingual exhibits may expand access to science learning for Latinos in U.S. science centers and museums. Top: Bilingual study participants look at and point to a map within a bilingual exhibit at the San Diego Natural History Museum. Photo shot with a SenseCam worn by a study participant. Center: A bilingual visitor group interacts with geology exhibits while researchers record observations. Low resolution photo shot with a SenseCam worn by a researcher. Bottom: Bilingual visitor groups use both languages when reading and speaking. Photographic data from a SenseCam worm by a study participant shows a rock with an embedded fossil, multi-party touching, and pointing to English text (left) and Spanish text (right). In analysis, the research team will integrate data fro audio recordings, live observations, SenseCam images, and activity-in-context photographs. Is your museum convivial? Have you visited a museum where you’ve felt particularly energized and alive? We invite you to share images and stories—and to join Kathleen McLean and me during the ASTC Annual Conference to celebrate museums that cultivate this essential quality of vibrant public places. In our recent book, The Convivial Museum, we suggest that these are key dimensions of conviviality: a welcoming spirit, orientation to the community, comfort, opportunities for social engagement, and places for healing and renewal. The book focuses on physical features of museums—like approaches, entryways, seating, lounges, and nooks—because although they are often overlooked, they have profound effects on the quality of a museum experience. For more, check out the discussion Nina Simon hosted on her blog earlier this year. Use the Bits feature of ExhibitFiles to submit your image, video, or story of a convivial museum experience, and be included in a dynamic discussion of successes and failures, obstacles and opportunities. Be sure to identify the image and include a comment about the convivial quality of the place, how you (or others) are working to make it more convivial, or a question or challenge it represents. Log in and post a Bit; or share your image and story on Facebook (or email me). The conference session is on Monday, October 17, in Baltimore,10:45 a.m.- 12:00 noon. 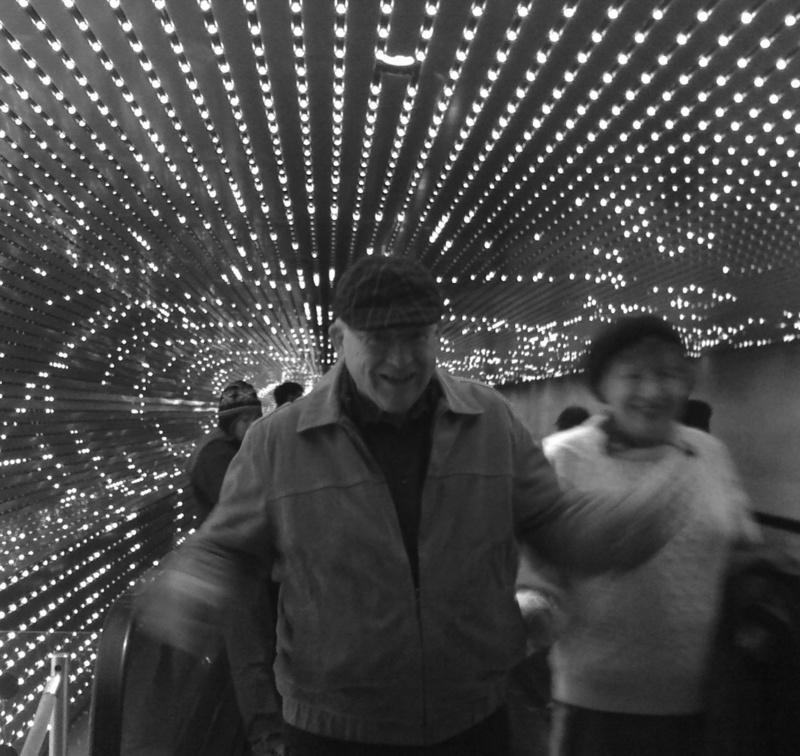 About the images: Darcie Forhman’s photograph of visitors to Washington, D.C.’s National Gallery of Art (above) is in a section of The Convivial Museum about ambience. Erik Thogersen’s photograph of comfortable seating (left) is from his review of a new building at the Denver Art Museum. Another example is the Center for Creative Connections, which Kathleen McLean profiles in her case study. With deep thanks to all of the museum planners, photographers, and authors who contributed to the making of this book, Kathy McLean and I would like to announce the publication of The Convivial Museum. The book explores key dimensions of a defining quality of vibrant public places that we call “conviviality”—a welcoming spirit, orientation to the community, comfort, opportunities for social engagement, and places for healing and renewal. The focus is on the physical character of museums, which, while all too often overlooked, has profound effects on the quality of a museum experience. For all those who share a vision of the broad social role of museums, we offer The Convivial Museum as a timely reminder of the simple but deeply important practices that make museums critical components of civic life. Designed for ease of browsing, the book includes more than 130 images and thought-provoking quotations, some contributed by ExhibitFiles members. The book complements an earlier, companion volume, Visitor Voices in Museum Exhibitions, which advocated for active individual and community involvement in creating museum exhibitions and programs. Both books were supported in part by grants from the U.S. Institute of Museum and Library Services. The Convivial Museum is available in a limited, print edition. To order either book (or both) visit the ASTC website. It’s been a convention of long standing in the museum world that visitors should cover as much ground as possible, on foot. The economics of museums in the United States reinforce this syndrome. Many have come to rely on earned income, buildings and related operating costs have grown, results often are measured in attendance numbers, and visitors have to keep moving in order for the museum to achieve adequate “through-put.” And if you’ve paid a substantial amount to get in, you probably want to keep moving so you can see as much as possible. But as recent posts suggest, people feel an opposite tug, a desire to slow down and savor their experiences. Two recent contributors mentioned their trepidation about visiting (separately) a Picasso exhibition. Anticipating long lines and an $18 admission fee (plus parking) and in one case even fearing a “claustrophobic” experience, they steeled themselves. There’s more about seating and other comforts in our forthcoming book, The Convivial Museum, available from ASTC. Sometimes it’s the simplest things that are the most memorable. But as Susie and her commentator suggest, a basic attitude of care and human concern reminds us daily to see things from the perspective of those we’re there to serve. That way, we’re likelier to call to mind those design ideas when we need them most. The article offers a framework for thinking about things most of us already know, if only from being museum visitors ourselves. Fatigue, distraction, too many things to see and do all at once all work against attention. But what about the value proposition–how do we make an exhibit that compels people to turn attention that way? It comes down to two simple things, Steve writes: “(1) by selecting high interest exhibit content; and/or (2) by designing exhibit elements that stimulate curiosity.” The heart of exhibition design, its mystery and challenge–and the reason we get to know the people we’re designing for. “An Attention-Value Model of Museum Visitors” was published by the Center for Advancement of Informal Science Education (CAISE) and is available as a downloadable PDF on the CAISE website. How did you get here – and will you come back? Word of mouth: That’s how most members found out about ExhibitFiles. Others stumbled upon it while searching the web. That’s by design: the site uses a number of strategies to make it likely profiles and posts will show up high on search results. Once people have joined, why do they come back? For inspiration and help with a new project are two big reasons. But email from the site is number one – a reminder to come back and see what’s new. That’s why we’ll be relaunching the newsletter soon. We’re looking forward to seeing members come back often, and contributing more. These findings are based on a study carried out earlier this year by Carey Tisdal of Tisdal Consulting, St. Louis, Missouri.